"One of the staple articles of hunter attire, fashioned at the workshop. A product of the scourge of the beast that once plagued Old Yharnam and culminated in the town's fiery cleansing. flames and stench of singed blood." 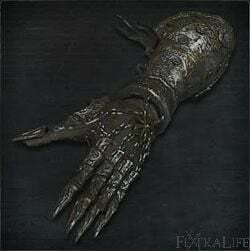 When this piece is equipped, it seems only the left hand has the metal gauntlet depicted in the picture. The right hand gets a simple black leather glove with some gold coloured chains wrapped around it.